The PM30 Series Power Meter is ideal for applications that require real time optimization. These power meters feature a combined analog and digital display. The analog meter is large and easy to read, and the fine analog needle provides enhanced sensitivity when aligning systems for maximum efficiency. The digital display offers better absolute accuracy than can be achieved with a purely analog meter. This portable and robust unit has an analog output and a built-in RS-232 interface. 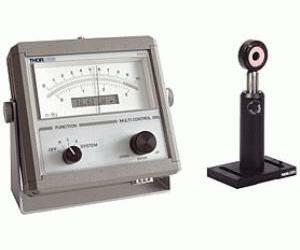 These high sensitivity analog power meters are designed for fine adjustment of setups. The PM30-120 Series comes complete with our standard Si or Ge sensors. An attached IR viewing target enables easy alignment of the sensor head. These sensor heads can be equipped with FC, SMA or SC fiber adapters.